Now THIS is more like it. This was an issue I had read when it was originally released, and I enjoyed it now, and I enjoyed it back then. Of course, whatever checklist I was working from that listed this issue before Valor #23 did me a disservice…this one had a footnote to see that issue. But I already had my mind set on reading this next…and hey…wibbly-wobbly and all that. This is just the eighth issue of the 1990s Superboy series…focusing on the Superboy that appeared in the whole Return of Superman shindig. This is well before his Kon-El days, even before he had an inkling, really, who the Kents were (He doesn’t even have a bit of recognition of them in this issue!). After Crisis on Infinite Earths, there was no longer a Superboy, who was "Superman when he was a boy." Of course, when you have a Crisis (in Time) and have other-timelines’ characters popping up and such…why NOT a timeline where Superman WAS SuperBOY first? So we pick up on Superboy accompanying a plane across Kansas. 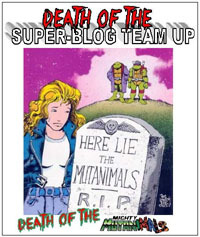 His travel-buddy Dubbilex needs the plane, and has rescued Krypto (Bibbo’s dog that was gonna be named Krypton but wound up Krypto cuz of a jerk tag-maker…see the Funeral for a Friend/World Without a Superman story for that, if I’m recalling correctly). Superboy and the dog aren’t getting along, and Superboy’s riding on the wing of the plane…whether it’s BECAUSE of the dog I’m not sure, but I guess it doesn’t matter TOO much. When the plane’s hit by lightning and about to crash, it’s rescued–by Superboy…and Superboy! 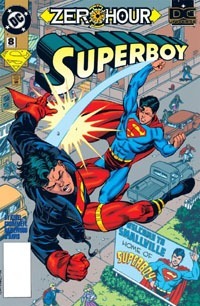 The second Superboy, wearing the classic Superman costume appeared with the lightning, apparently after some adventure in the future. He guides the plane to Smallville, recognizing the sign stating it’s the home of Superboy, and then seeks out familiar territory. While "our" Superboy gets some attention in town, the time-displaced Superboy changes to his guise as a young Clark Kent…and finds some unsettling surprises. And of course, eventually the two Superboys meet up (how neither realized the other assisted with the plane can be chalked up to "It’s comics!") and fight…before realizing there’s no need for fighting, and that there are forces at work beyond even the two of them. As the displaced Superboy fades out, Superman/Green Lantern/Metron’s message arrives, and Superboy springs into action. I’ll say it again: this is more like it! While "the message" does not come until the end of the issue…within this issue we HAVE a Time Anomaly, a character whose only way of being capable of even appearing IS the weirdness with Time, as a result of what’s going on with Zero Hour…making this a great tie-in! And at a time when "elements" of the pre-Crisis era were seeping back into the Superman mythos, albeit with "modern" twists rooted within the new continuity, this Superboy was an interesting contrast…a sort of having the cake and eating it, too. I suppose in most modern ways of comparing, it’d be like Kon-El showing up in the New 52 for just one issue and that’d be that. In a way, I wasn’t even paying attention to the story as I read this…I just thoroughly enjoyed the issue! Grummett‘s art is fantastic, and Hazlewood/Davis/McCraw do an excellent job enhancing that with inks and colors. After reading some of the other tie-in issues, this one was a very welcome one in both art and sheer enjoyment. While there’s not a lot of context for the ongoing series, as a one-off, this is a fun issue…basically showing the "real" Superboy encountering one from a different timeline, providing some comparison/contrast between the two, and then setting things back before ending. Other than allowing "our" Superboy to be able to say that he encountered a Time Anomaly already (and as readers, we were thus along for the ride having read this issue), there doesn’t seem to be anything here to really move the SUPERBOY story along…and yet it fits then-current continuity and ties into Zero Hour and is one of the better examples thus far of something tying into the event. Well worth it if you find it in a bargain bin!